Like most people, my first experience of doing pottery was at school many years ago, but it wasn't until I moved to Japan with my job in 2000 that I got back to it. In a vain attempt to learn Japanese I thought it'd be a good idea to study something in the language, so I turned to a private pottery school. Little did I realise then that I was embarking on a passion that would be with me for the rest of my life. I was, and still am so grateful to those young Japanese pottery teachers and their willing encouragement. Indeed, I still sign all my work in Japanese because of them. 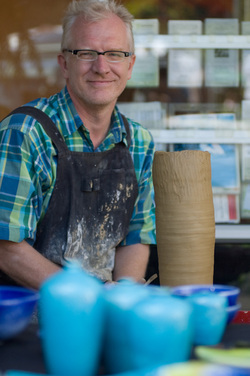 On moving to New Zealand the following year, I immediately continued my education at Auckland Studio Potters under the guidance of Peter Lange and Renton Murray before becoming a member of Titirangi Potters, in whose studio I still do the majority of my work. I have taken part in the annual exhibition of Titirangi Potters many times now and have had exhibitions of my work at the West Coast Gallery in Piha. I sell my work there and have work in Lopdell House Gallery and the Pah Homestead and I can also be found at Titirangi Market on the last Sunday of every month. The influences on my work are mostly explained by the above history, I suppose. Firstly, I developed a great love of clean classical shapes and lines and a rather sparse feel to my work from my time in Japan. I have always been fascinated by bright colours, with the blues and greens in my work perhaps reflecting the environment of Auckland's West Coast and the Waitakere Forest, where I live and walk my dogs. I also have a mild fascination for art deco, modernism and Indian temple architecture, which occasionally intrudes. The elephants stem from an obsession that started back in the 1980s when I visited the elephant orphanage in Sri Lanka and fell in love as I fed one of their babies from a (very) large bottle. I love working on the wheel, though for larger pots I sometimes use coiling as I find it a very therapeutic way of working and it gives my rather slow brain the opportunity to develop the idea of the pot as I'm going along. A lot of the tiles use wood block printing stamps from my travels in India, along with some of my own that I've carved. Recent work has been affected by a residency in Himachal Pradesh, where I became fascinated by animal horns and stupas.